Matthew Piper: What is architecture? What is design? Minimaforms: We do not separate or find productive definitions that privilege the differences or limits of what art, architecture, or design is. Our approach is very much based on creative forms of enquiry that engage the problem or brief at hand. Our pursuits are not driven from a stylistic or technique-based approach but on a sensibility and a desire to explore communication through enabling participatory and collective means. MP: What draws you to the concept of the “minimal?” How does your work embody it? M: “Minima” came from a conception of space and time that was being discussed in the sciences of complexity. It takes the position that all matter is in a constant state of change and that form appears as a moment of stability. This moment of perceived stability is our constructed relationship with the world that engages us as observers and participants. Our name Minimaforms came from this thinking. MP: I’m curious to know if you created together as kids. If you did, what did you make? M: We have since our early childhood been curious in exploring our surroundings. It was not until we moved together to London in 2002 that same early curiosity could be channeled in a form of serious play. Steve went to study at Central St. Martins and I took a teaching position at the AA School of Architecture while working for design offices like Zaha Hadid Architects. During this period we began to explore and experiment with new processes and forms of interaction that challenged the fixed and finite. We were both searching for opportunities to explore work that went beyond conventions of traditional architecture and design. Stephen, training as an artist and interaction designer, and myself as an architect, found this through a conception of space as an environment. Minimaforms was formed in this period and has continued to be our experiment. MP: In “Twenty-Five Sentences on Minimaforms,” David Greene writes that the most important desire of Minimaforms is “the desire to re-inhabit the city.” [Note to readers: that document is really worth a look.] Do you agree? Can you address that aspect of your work in more detail? It struck me because it’s also such an important desire for so many Detroiters right now. While, of course, our city has never been uninhabited, it has in recent decades been famously less inhabited, and (less famously) inhabited in ways that reinforce social divisions and inequality. We’re currently seeking new ways to inhabit it together. Did this feature of life in contemporary Detroit influence your decision to install Memory Cloud here? M: It is an important feature of our work and the interest arises through the desire to explore new forms of communication and interaction. The urban environment of a city plays host and witness to this evolving human engagement. We see design as assisting and challenging the inert built environment, enabling new relationships that give over the city to the people. It seems in contemporary times people’s engagement with the city has become pre-conditioned or limited; it is important for us to find means in which we can explore space as public and shared. The city is very much a creative and life-like partner in our everyday, and we explore ways to intervene and make this evident through our work. Memory Cloud is a direct form of this inquiry through the expressed thoughts and emotions of people. Cities are environments and they are shaped and evolve through their inhabitants. Detroit, like many cities, is in a process of reinventing itself and through this engaged moment of transformation, allowing itself to creatively come to terms with its immediate present and potential future. With respect to our involvement with Detroit, we felt that we could offer a framework or platform through Memory Cloud for the voice of the people to hold a conversation with the city itself. 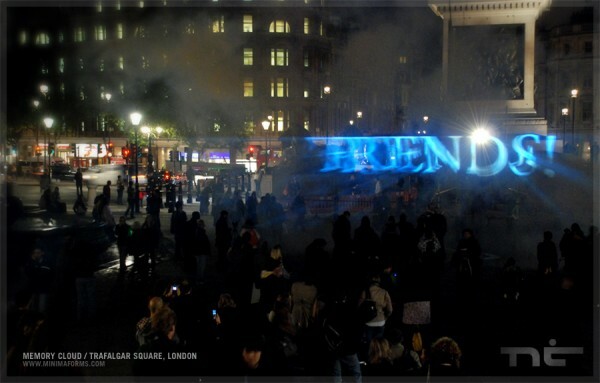 We have had many offers to perform Memory Cloud since we performed it in Trafalgar Square in 2008; we had resisted until now. We believe that Memory Cloud: Detroit can make a difference, giving people in the city an instrument to communicate with the city itself. MP: You’ve mentioned that Trafalgar Square was an ideal space for the first incarnation of Memory Cloud because it’s so public, used so often for collective action and expression. Since it’ll be presented here in a somewhat more traditional art context, Memory Cloud: Detroit will have something of a different aura (though it’ll still be visible to unsuspecting passersby). Can you talk about that difference? How has the project evolved since 2008? interaction and participation. In themselves, the Memory Cloud works could be understood as context-less, but they are conceived as prototypes that are open systems with the capacity to become context-specific. 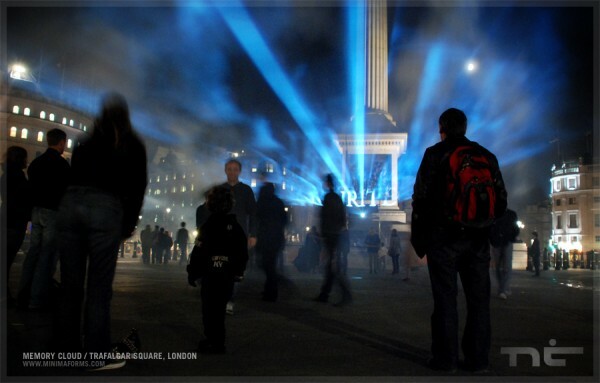 In our Detroit version, the project will share the medium of smoke signals and light projection, as in the Trafalgar Square performance, though the emphasis will be on giving the people of Detroit an opportunity to engage in a dialogue about the city as part of a collective act. 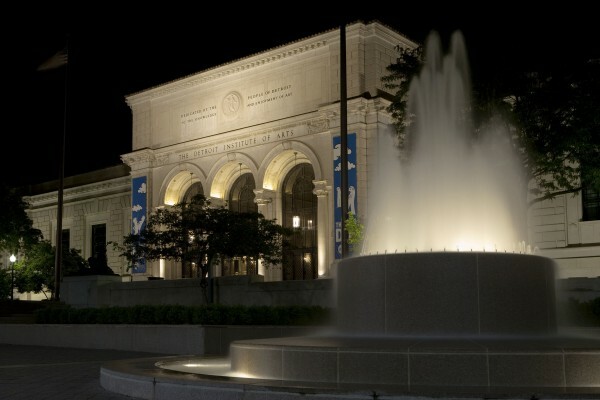 We will animate DIA’s Woodward Entrance with stories collected from the public. Each individual expression will be part of a continuous story about the city, a narrative written by participants over the duration of the project, transforming the steps of the DIA into a dynamic space for communication. Audience members will also be able to contribute messages via text-message during the performance each night. These collected text messages will be added to the Voice of Detroit archive, becoming part of an evolving diary and a voice that will speak of Detroit’s past, Detroit’s present and Detroit’s future. MP: When I first started researching Memory Cloud, I was tantalized by the Telegraph‘s description of it as “potentially the most dramatic — and also most obscene — art events ever to be held in London.” I then read that text messages were, in fact, screened for content before they were displayed. I admit to being a little disappointed; there’s something dangerous and exciting about the idea of unfiltered, anonymous, real-time expression. I assume you’ll also screen messages in Detroit. Was this a difficult decision to make? What concerns guided it? M: Every context or institution has its own rules and regulations. In London, as you mentioned, we were asked to develop a tool that would allow the city to screen the messages, as the city had concerns that ranged from inciting riots to religious intolerance. From an artistic perspective we made this affordance as a precautionary measure that allowed for the project to be performed. 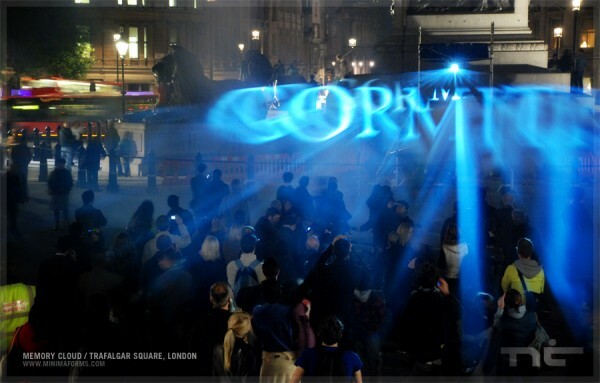 The project itself brought to the forefront the complexities of this kind of event. The installation itself was only the third public art project to use the space of the Square, the first a piece by Krzysztof Wodiczko, which was a projection performed in 1985. It was critical for us to find a way to work with the city and realize a project that reinstated a public forum in the heart of the city through an artistic framework without compromising its integrity. Though we developed this tool, few messages were deemed unacceptable by the City of London for their content. Most of the messages that were removed were attempts from brands to use the piece to promote their commercial interests. It surprised the city officials that most of the sentiment was novel and respectful. In Detroit, the piece will be governed by the rules of the context we are operating in. As artists we are constructing a platform and we do not edit or create the content. This is very much a context specific intervention in all aspects. MP: If the text messages sent and displayed comprise a conversation, it’ll be a sort of one-sided conversation (or rather, many one-sided conversations). This reminds me of World Question Center, a 1968 James Lee Byars TV piece that was recently on view at Detroit’s Museum of Contemporary Art. In it, Byars places phone calls to dozens of thinkers and invites each to ask a single question that has special significance for his or her particular field of inquiry. There are never answers, only questions. David Greene writes that Minimaforms has a “desire to be useful in the world” — what, to you, is the utility of facilitating a public conversation that is, on its face, incomplete? and density of the space of projection. The observer’s spatial perception continually pursues dynamic stability through forms of legibility in motion perception. One of the important things for us is to find ways to enable people to participate. The move towards making things more shared and collective also encourages people to really engage with things. That level of engagement is very important to us. One of the key features of this kind of work is that people who are participating see their contribution to the project. The project takes on the identity of the viewer, it becomes an extension and instrument. Minimaforms is based in New York and London. Their work can currently be seen as part of the Museum of Modern Art’s exhibition “Talk to Me: Design and the Communication Between People and Objects.” Memory Cloud: Detroit will take place at 8:00 pm at the Detroit Institute of Arts on Friday, 9/30, Saturday, 10/1, and Sunday, 10/2.